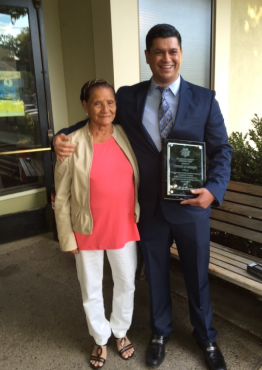 Congratulations to Detective Leo Moreno as the 2015 recipient of the Herb Ross Community Achievement Award. Detective Moreno was honored by the Capitola Public Safety Foundation as the Officer of the Year for all is efforts in the community and his work as a detective. Detective Moreno is the lead detective who supervises the investigation section, organizes the departments participation in the annual Tip a Cop event, coordinates the Special Olympics torch run through Capitola, coordinates the Police Departments neighborhood watch program, participates with the Community Action Board, a department representative to Monarch Services (formally Women’s Crisis) and the department representative to the Elder Abuse Task Force and the Financial task force, and the department representative to the Ombudsman’s Office. With Detective Moreno is his proud mom. We congratulate Detective Moreno for all his hard work. Herb Ross was born March 5, 1942 in Palo Alto, California, one of ten children born to Phillip and Marie Ross. He grew up in Palo Alto, Boulder Creek and Santa Cruz. He was a graduate of San Lorenzo Valley High School, he later attended Gavilan College and graduated from Cabrillo College with an associates degree in Administration of Justice. Herb served in the U.S. Air Force and in his earlier years worked for the U.S. Department of Forestry as a wild land firefighter and also worked at Lockheed before entering law enforcement. He began his career in law enforcement as an officer for the Capitola Police Department in 1973 and retired as a Sergeant in 2001. During his tenure he was responsible for developing several community outreach programs which included the first Drug Abuse Resistance Education Program, the Juvenile Diversion Program, Cops reading to kids, and the Safe Ride Home Program.Herb received a mayor’s proclamation for his service in 1996 and the following year was named Citizen of the Year by the Capitola Chamber of Commerce.